FOUR ON THE FLOOR: Feet First! 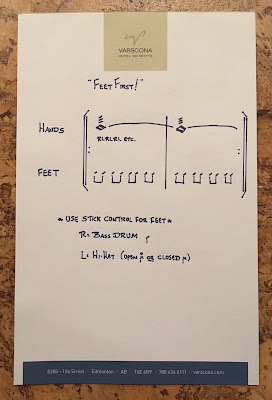 A simple, little exercise today that I call "Feet First!" The general idea is that you play a quiet, sustained buzz, double or single stroke roll on the snare drum with your hands along with a steady stream of eighth-notes between the bass drum and hi-hat with your feet. The point of this exercise is to lead things rhythmically with your feet. All to often as drum set players our feet take a backseat to what we are doing with our hands. This is intended to be a simple way to get you thinking about leading with your feet (or from the "bottom up"). I would practice this playing whatever snare drum roll you choose around a piano or mezzoforte dynamic level while the feet should be a solid forte. Thank you Ted Warren for the inspiration for this one!